Is AirAsia Indonesia flight QZ 8501 a repeat of Northwest Airlines flight NW 705? AirAsia Indonesia (Indonesia AirAsia) (Jakarta) vanished from radar screens over the Java Sea on December 28 on a flight from Surabaya to Singapore with 162 passengers and crew members on board. Tragically there were no survivors. Investigators have ruled out any act of terrorism. The same group has stated it was unlikely an explosion brought down the airliner. According to the preliminary reports, there were no sounds of gunfire or explosions on cockpit voice recorder. Analysis of the flight data recorder of Airbus A320-216 PK-AXC (msn 3648) operating flight QZ 8501 showed the A320 climbing at an abnormally high rate, then plunging and suddenly disappearing from radar. The A320 was climbing at a steep ascent of 6,000 feet a minute (a normal climb rate is 1,000 to 2,000 feet a minute) before it suddenly dived and crashed in the Java Sea. This is not a normal climb rate. The crew had asked air traffic control for a higher altitude due to severe thunderstorms in the area. The request was denied due to other air traffic in the area. Was flight QZ 8501 trapped in the updraft of a severe thunderstorm and then it stalled and fell to the sea? It has happened before with devastating results. Dial the clock back to February 12, 1963 over Florida’s Everglades. While the crashes of ValuJet Airlines flight 592 and Eastern Airlines flight 401 are more well known, there was a third crash in the Everglades that is very similar to the tragedy of AirAsia Indonesia flight QZ 8501. Both involved flying into severe thunderstorms. Northwest Airlines (Northwest Orient Airlines) flight NW 705 was a regularly scheduled flight from Miami International Airport to Chicago’s O’Hare International Airport. After takeoff from MIA the flight crew operating Boeing 720-051B N724US (msn 18354) encountered an approaching cold front with large thunderstorms. The crew tried their best to avoid the approaching line of thunderstorms. After the jet lifted off from runway 27L, it made a left turn based on radar vectors from Miami Departure Control, to avoid areas of anticipated turbulence associated with thunderstorm activity. Another flight had followed the same guidance shortly before the jet took off. At 13:45, control of Flight 705 was transferred to Miami Air Route Traffic Control Center. There were communication difficulties, although after the jet was provided with a different frequency to tune to, the flight crew established contact with Miami ARTCC. Several minutes after contact was established, the jet’s altitude began increasing with a rate of climb gradually increasing to approximately 9,000 feet per minute. Following this rapid ascent the rate of climb decreased through zero when the altitude peaked momentarily at just above 19,000 feet. During this time the jet’s airspeed decreased from 270 to 215 knots and as the peak altitude was approached, the vertical accelerations changed rapidly from 1G to about -2G. In the next seven seconds the negative acceleration continued to increase at a slower rate, with several fluctuations, to a mean value of about -2.8G, the jet began diving towards the ground with increasing rapidity. As the descent continued with rapidly increasing airspeed, the acceleration trace went from the high negative peak to 1.5G, where it reversed again. Below 10,000 feet the forward fuselage broke up due to the forces of the dive. The main failures in both wings and horizontal stabilizers were in a downward direction, and virtually symmetrical. The forward fuselage broke upward and the vertical stabilizer failed to the left. All four engines generally separated before the debris of the aircraft fell in unpopulated area of the Everglades National Park, 37 miles west-southwest of Miami International Airport. 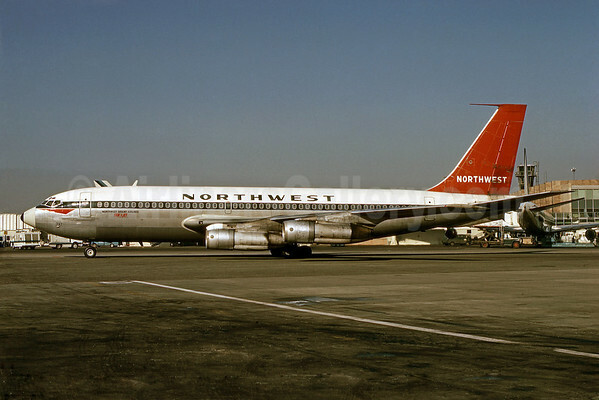 Northwest Airlines, Inc., Boeing 720B, N724US, operating as Flight 705, crashed in an unpopulated area of the Everglades National Park, 37 miles west—southwest of Miami International Airport at approximately 1350 e. s. t., on February 12, 1963. All 35 passengers and the crew of eight were fatally injured. Flight 705 departed Miami at 1335 e.s.t. Circuitous routing was utilized during the climbout in an effort to avoid areas of anticipated turbulence associated with thunderstorm activity. At 1347 e.s.t., in response to a request for their position and altitude, the flight advised, “We’re just out of seventeen five (17,500 feet) and stand by on the DME one.” This was the last known transmission from the flight. Shortly thereafter the aircraft entered a steep dive, during which the design limits were exceeded and the aircraft disintegrated in flight. The Board determines that the probable cause of this accident was the unfavorable interaction of severe vertical drafts and large longitudinal control displacements resulting in a longitudinal upset from which a successful recovery was not made. As the investigation of Northwest Flight 705 proceeded, other jet transports became involved in similar upsets. These pitch upset events were collectively referred to as “Jet Upsets.” This terminology was used because the phenomena appeared to be unique to the new generation of swept wing jet transports which began to enter service a few years earlier. The investigation of Northwest Flight 705, and associated similar pitch upset incidents, led to changes in operating procedures and design requirements for jet transports, as well as improved forecasting and dissemination of hazardous weather information to Air Traffic Control and Flight Crews. These actions proved effective in substantially reducing the occurrence of this type of pitch upset events. Was QZ 8501 a repeat of NW 705? Copyright Photo: Bruce Drum/AirlinersGallery.com. Sister ship Boeing 720-051B N737US (msn 18793) is pictured at New York (JFK). This entry was posted in AirAsia (Indonesia), Northwest Airlines and tagged 18793, 720-051B, AirAsia, AirAsia (Indonesia), AirAsia flight QZ 8501, Boeing, Boeing 720, Boeing 720-051B, Everglades, flight QZ 8501, latest news on AirAsia flight QZ 8501, Miami, Miami International Airport, N724US, N737US, Northwest Airlines, Northwest Airlines flight NW 707, Northwest Orient Airlines on January 21, 2015 by Bruce Drum.